This five-piece outfit from California delivers technically demanding, high-velocity prog metal. References include Dream Theater, Enchant, Fates Warning and Shadow Gallery as well as the more classic rockers such as Rush and Deep Purple. The band consists of Matthew Bradley on vocals, Patrick Reyes on guitar and brother Steve Reyes on bass, Jeremy Colson on drums, and former Zero Hour keyboard player Matt Guillory. 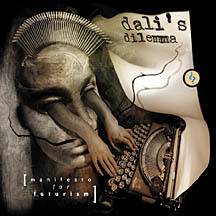 Manifesto for Futurism (1999) is a ten-piece set that features strong musicianship (you'll notice some elegantly gothic, neo-classical tinges in their guitar lines). Some may bash the band for being another Dream Theater clone but they do stand on their own, both from a compositional and lyrical standpoint. Perhaps one aspect they could improve on is in the melodic department; a little more feeling in their play would be welcomed as well. Technically speaking, they are flawless. Recommended for Dream Theater fans, especially of the Images and Words and Awake period.